10 Fun games to keep your guests entertained at your Mehndi ceremony! Mehndi ceremonies are all about extremely cool decor, colourful vibes and of course loads and loads of fun. Talking about fun, this time we came up with an extremely offbeat list of games to add some really exciting and funky memories to your wedding celebrations! Who can deny a game of friendly beer pong, or those life-size jenga challenges! Keep scrolling to see what supercool games we have in store for you that would not only pop ideas in your head but would also make you nostalgic by bringing out the child in you! 1. The war that brings you closer-tug of war! I simply love this one, especially when the opponent is the groom’s team - you just can’t lose! I mean you lost your heart to him, isn’t that enough? 2. Pop those balloons in style! Shooting seems so much fun when the bullet pops a colourful balloon! And let’s not forget the prize that follows! 3. Roll around freely in this amazing zorb ball! This one is my personal favourite because first of all its a ZORB ball! I mean, rolling around freely when bumping is so much fun? Would never say no to that! Moment of nostalgia people! Colourful papers flying around the sky is obviously amazing, but the real fun starts when you shoot down your competitor’s kite, doesn’t it? 5. Want a gift? Go ahead and ring it! Everybody would give this fun game a try cause the gifts are right in front! You just gotta ring it! 6. Falling off has never been so fun! 7. 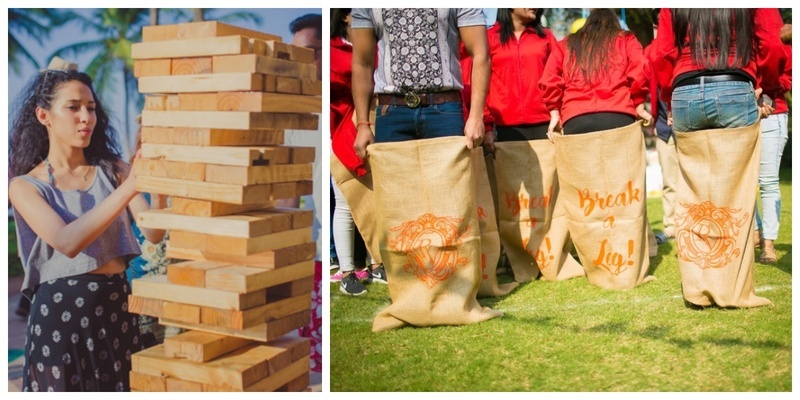 Gear up your skills cause its a giant JENGA! 8. Say hello to the elephant polo! 9. Ladies, buckle up for a table tennis game with your better half! 10. Hop around for the supercool sack race! 11. Beware of the number 99 snake bite- it’s always a bummer! 12. Beer pong- The only game where losing is fun cause you get to drink! 13. A game of darts- cause it’s everybody’s favourite! So ladies, do not miss to include fun games to add those additional stars to your already lit Mehndi ceremony!